AUSTIN – State game wardens have wrapped up an extensive 16-month poaching investigation in East Texas that has netted stout fines and jail or prison sentences for four men responsible for illegally killing 30 deer in Wood and Rains counties. Wood County Game Wardens Derek Spitzer and Kurt Kelley along with Van Zandt County warden Steve Stapleton began the investigation on Dec. 7, 2010 when a dead deer was found hanging from an oil well pump jack on a wooded 1,500-acre tract near Alba. Only the deer’s backstrap had been removed, with the rest of the meat left to waste. The subsequent investigation, which involved an estimated 270 man hours, uncovered an extensive pattern of deer poaching in both Wood and Rains counties. During the course of the investigation, the wardens conducted several protracted interviews, secured a large amount of evidence, and were able to document the illegal killing of 30 deer by four individuals. All of the deer had been killed at night from public roads with the aid of a spotlight over a three-month period. In one documented incident, two of the men involved were found to have shot two deer behind a high fence at night and returned later with a pair of bolt cutters, which they used to cut a hole in the fence and remove the deer. Most of the deer meat in the investigation was found to have been wasted, with the violators often only taking the backstrap from the animals. While probing the hunting law violations, the wardens recovered multiple stolen items and several theft cases are still pending. A total of 528 offenses were determined to have occurred with 40 of those being state jail felonies. Of the total offenses known, 22 charges were brought forward in Wood and Rains counties. Nine Class A misdemeanor charges and two state jail felonies were filed in each county. Of the four defendants, three made plea deals with prosecutors with one of them entering a plea in exchange for a one-year sentence for hunting deer without a land owner’s consent. The protracted investigation was finally closed on February 23 when the fourth subject changed his plea to guilty and received 3 years in state jail and $12,000 in fines for hunting deer at night, hunting with artificial light and hunting from a vehicle – all Class A misdemeanors. Sentences handed down added up to more than $41,000 in fines, 3,000 hours of community service and a total of 12 years of jail or probation time. In addition, six firearms were seized and awarded to the state. Finally, all the defendants lost the privilege of hunting in the state of Texas for five years and will be paying civil restitution for the game animals taken. For more information on the defendants and the charges filed against them, please contact Wood County Asst. Dist. Atty. Joey Fenlaw at 903-963-4515 and Rains County DA Robert Vititow at 903-473-5000, x. 115. 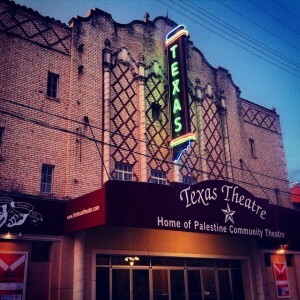 Palestine, Texas – The City of Palestine is launching their ‘Visit Palestine TX’ mobile app for Android, iPhone and iPad users. The mobile app puts attractions, events and more at the fingertips of both visitors and locals. Martin’s program has been described as a Dust Bowl-Great Depression presentation with a twist, in that he looks at this period of time from the perspective of an insider looking out rather than from, as is more often the case, of an outsider looking in. Some of the causes and consequences of the period of extensive internal migration that took place back then are viewed in terms of how they were actually experienced by a family of migrants exemplary of many others.